1. Explore Atlanta on your feet! Take a walking tour offered by Atlanta Preservation Center and discover the most significant landmarks of the city – historic Downtown, Sweet Auburn, Inman Park and Fox Theater. You may even recognize Druid Hills, the neighborhood featured in the movie Driving Miss Daisy. Admission: $10. 2. Did you believe in magic when you were a child? Experience the same feeling again when you come to the Center for Puppetry Arts. You will have a unique chance to discover the secrets of puppet making. Make sure you visit the Jim Henson exhibit to meet his famous creation, Kermit the Frog, and the rest of the Muppets. Admission: $8.25. 3. What do you know about the Battle of Atlanta? 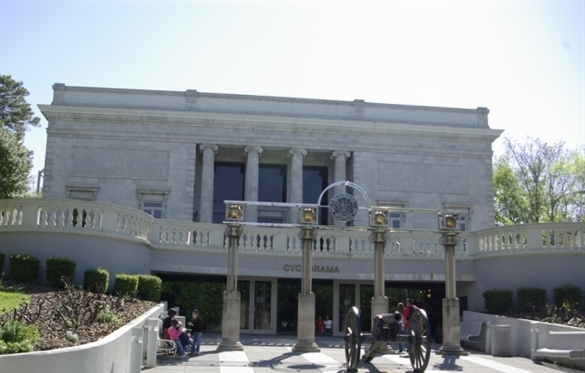 Visit the Atlanta Cyclorama & Civil War Museum to see one of the largest diorama paintings in the world depicting a fierce battle of 1864. Entering through a door in the floor you can observe every little detail of this impressive panoramic presentation with a three-dimension effect. Adult admission: $10. 4. Have you ever looked into the night sky and wondered what secrets were hidden in outer space? Visit the Fernbank Science Center planetarium, the largest in the USA, and find all the answers to your questions! Knowledgeable Fernbank astronomers will guide you through the wonders of the universe. Admission: $5. 5. For those interested in art, the Atlanta Contemporary Art Center is the perfect place to discover modern artists and learn about new trends in contemporary art. Promoting cultural diversity, this center is also known for its sophisticated programs. General admission: $8. FREE every Thursday! 6. How about a date in old-fashioned style? Visit Atlanta's famous Starlight Six drive-in theater. You can enjoy a snack bar and six outdoor screens showing current major motion pictures year-round for $7 per person. 7. If you want to enjoy a panoramic view of Atlanta, visit The View atop The Westin Peachtree Plaza, one of the city's skyscrapers and one of the tallest hotels in the U.S. You will have a chance to gaze at Atlanta through a telescope and enjoy a breathtaking view of its landmarks from more than 700 feet above the ground! View pricing: $6 for adults. 8. Would you like to experience the dark side of Atlanta? Go on a guided Twilight Tour of Oakland Cemetery offered by Historic Oakland Foundation. Discover Architecture of Death, the Art of Epitaphs and a lot of mysteries hidden in the city's oldest graveyard...if you dare. Admission: $10. 9. Do you know that Atlanta was home of Joel Chandler Harris, the beloved author of Uncle Remus' Tales? The Wren's Nest welcomes you to visit and immerse yourself in the world of African-American folklore. Admission: $9 for adults. 10. Jimmy Carter, the thirty-ninth president of USA, was born in Georgia. Known for his great humanitarian work promoting peace and democratic rights all over the world, he received the Noble Peace Prize in 2002. Located in Atlanta, the Museum of the Jimmy Carter Library displays many photographs and documents, enabling visitors to learn about his life and his presidency. Adult admission: $8.